About yesterday... thank you. I don't share these things because they are the thoughts and emotions that rule my days or because I want a 24 hour pity party. It's just the stuff that happens and it tries to get me down and then I usually find something about the stuff to laugh about and then I think: "I can't be the only woman who's made a bad dress or felt utter dread about moving day," so I spell it all out and try to get a handle on it. And the best part is that your thoughts and ideas are awesome and funny and true and kind and insightful and I feel much better about the good, the bad and the ugly. So, what would Heidi do? I think she would march me up and down a mountainside! And maybe packing, moving, unpacking, repairing, painting, cleaning and running around town is like marching up and down a mountainside! There'll be no time or strength left for whining! We found "Anonymous!" An amazing quilter in Michigan 'fessed up about knowing "Indiana Jones" so well that she can identify the female leads from the films. Chickenblog is going to send her some green to play with in the Amazon, so she can enjoy a little spending adventure. Congratulations and thank you for playing Liz! Ready for another big reveal? So, I showed you the towel racks, and Jennifer noted the absence of shag carpeting... I ask ya, could it get any better?! 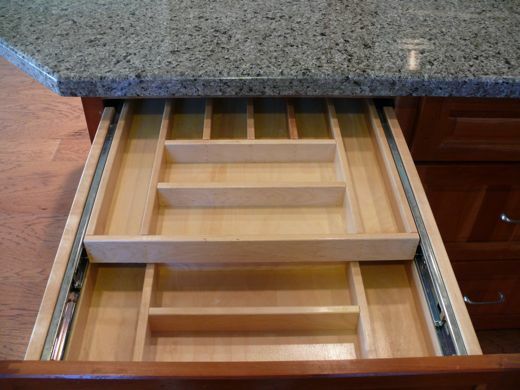 A drawer inside a drawer! It's the love child of Technology and Design. I refuse to imagine it in 3 months when I am trying to clean blackberry jam and granola out of the crevices. It will always be this lovely and good and pure. The countertop. Yes, it's granite. Yes, it is good too. Actually it's hard to not get granite in So Cal... something about a HGTV-Martha Stewart-Pottery Barn Ordinance decreeing that all California homes must have either granite countertops and/or designer paint themes. California is very special. To junk or not to junk? Geoff believes in the junk drawer. In the kitchen. It must be declared, and it must be dedicated to an undetermined assortment of things and stuff and those things must be either extremely necessary or absolutely useless. I shouldn't protest. In fact, I do not protest any more. I know it is inevitable that a drawer in the kitchen will succumb and be rendered junkful. How else to explain what is happening in this drawer? No one even lives in this house and yet the evidence proves it... junk happens. I definitely think you must have a junk drawer, and best to be in the kitchen. I can find no end of things in ours!!! Oh and so as not to embarrass ourselves in front of guests, it is called the middle drawer (yes it is in the middle). I agree there must be a junk drawer somewhere....ours is in the kitchen too. The same drawer it has been for the past 23 years, but I've had to actually organize it a bit since it started. And we DO actually find something in there now and then that we need! Um, Heidi seems a bit of a tyrant! Your drawers are b-eautiful! And I think every child needs memories of a junk drawer in the kitchen, growing up---do it for the children! We have a junk drawer here too... and yes it is in the kitchen. It is strange some of the things that have found a home in it! But I actually think there is more than one junk drawer here! I am a major fan of the junk drawer. I vote for a junk drawer. Your new kitchen is divine. I am drooling, and with granite it can be easily wiped off. Neat huh? As an addicted viewer of House Hunters and Property Virgins on HGTV (both hubby and I)(it's actually embarassing to admit that! ), I would be shocked, SHOCKED if ANY house for sale in North America didn't have granite counters, hardwood floors and stainless steel appliances! I'm going to contact HGTV and tell them they should do a montage of home buyers saying those three items. It would fill a two-hour time slot! Anyhoo.....lovely "junque" drawer! You'll be so proud to store your what-nots and "stuff" in that one! There's ALWAYS a junk drawer. You can't fight it. 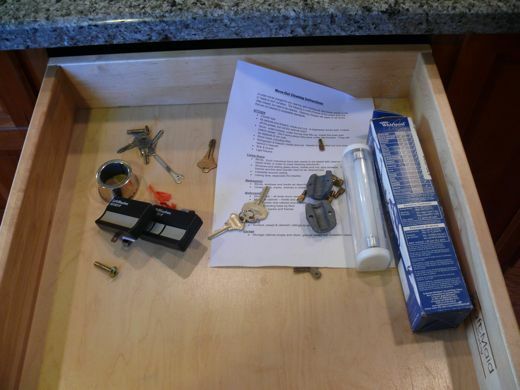 Yes, you need a junk drawer, but try and keep your husband's junk out of it! if you see what I mean......the junk drawer is no place for a hammer, or an adaptor or a whole range of screws and nails. Those things need to go in the toolchest. I'm sure you agree with me? You just have to convince them...! If this is a little tiny peek at your new kitchen - nice, nice and nice! We have a kitchen junk drawer and then we each have a "special" drawer in the bedroom...it accumulates all sorts of junk as well...I think it's healthy!